A young design-savvy couple called on the help of the local firm Schwartz and Architecture to envision their dream home; reimagining and restructuring a small Victorian Bungalow perched on a San Francisco slope. Located on a narrow grid of 25-ft-wide lots, the bungalow challenged the architects to formulate a suitable solution to make the most out of the space restricted site. In the end, Schwartz opted for lifting the house up and adding three floors, enabling the addition of a slanted parking garage with space for two cars located directly underneath the property. Schwartz’s space-saving tactic paved the way for a number of design decisions implemented throughout the home. 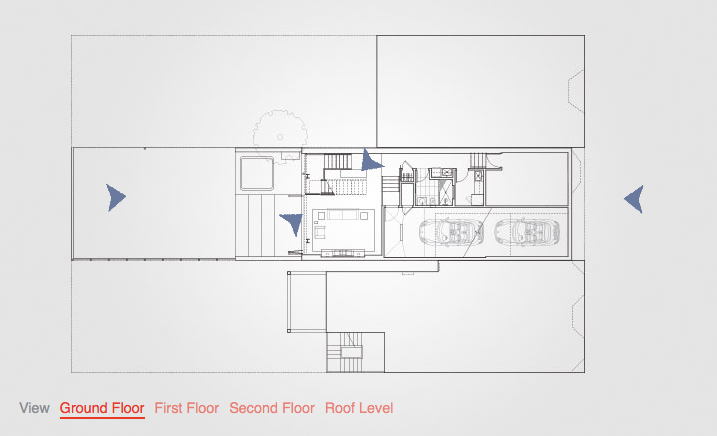 The property’s unique ‘stadium’ stairwell was added to conceal the underlying garage’s ramp, and consequently created a secondary social seating space within the narrow living room. As per the client’s request to capture the essence of Californian living within the property, an austere and light collection of colours and materials were chosen to bring the outside atmosphere within the walls of the home. In the basement walnut adorns the ceiling, and the ground floor showcases a subtle and soft palate with context-sensitive details, such as the kitchen’s geometric tiles which were specially selected to reflect the colours of the outside greenery. Due to the house’s dramatic restructuring of the interior programme, the ‘original’ street level now exists as the property’s second floor; the ground floor now hosting the kitchen; living room and outdoor deck and an extended barbeque area with the master bedroom situated on the second floor. Schwartz’s result is a seamless and unified living space which adheres to the small family’s wish for a private oasis in San Francisco’s tightly squeezed urban landscape.